Negative people just make you feel negative! I agree be with the people who make your life brighter. Negative Thinking Is As Importnt As Creative Thinking because If Creative Thinking Invents Aeroplane then Negative Thinking Invents Parachute. Avoid negative people, for they are the greatest destroyers of self confidence and self esteem. Surround yourself with people who bring out the best in you . 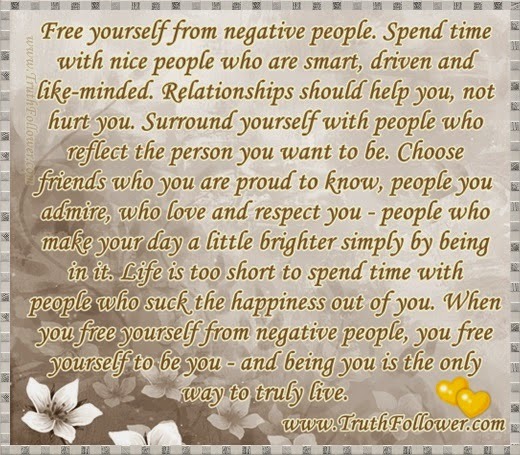 Free yourself from negative people picture/image is an Inspirational Stuff to Inspire and Motivate You. You can download pics by just clicking on the Images. Thanks for visiting Truth Follower an online place for huge collection of inspiring pictures, quotation, and Sayings Images. If you like Free yourself from negative people, Please Share with friends and family on Facebook, Twitter, and Pinterest.